Why Track Internal Search Term Click-Through & Exit Rates? So why should you do this? In the era of Google, we are all slowly being trained to find things through search. Many of my past clients saw the percent of website visitors using search rise over the past few years. In addition, Internal Search and Voice of Customer tools are some of the few out there where you can see the intent of your visitors. Unfortunately, most websites have horrible Internal Search results which can lead to site exits. In my previous Internal Search post I demonstrated how to track your Search Results Page Exit Rate, but that only shows you if you have a problem or not. If you do have a high Search Results Page Exit Rate, the next logical step is to determine which search terms your users think have relevant search results and which do not. Note that this is not meant to show you which terms lead directly to website exits, but rather, which terms cause visitors to use or not use the search results you offer them after they search on a particular term. 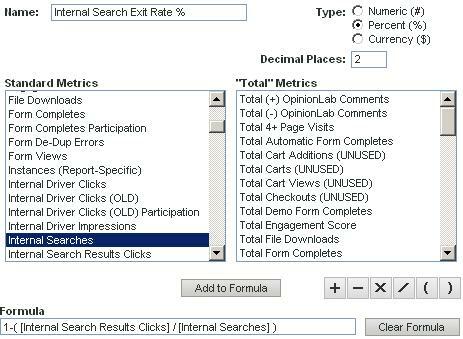 How Do You Track Internal Search Term Click-Through & Exit Rates? Make sure that you are setting a Success Event when visitors conduct Internal Searches on your website. Hopefully you are already doing this so in many cases this step will be done! Make sure that you are capturing the Internal Search Term the visitor searched upon in an eVar variable. Again, you should be doing this (if not, shame on you!). Here is where we get into uncharted territory. The next step is to set a new Success Event when visitors click on one of the items on the search results page. Depending upon the technology you use for Internal Search, this could be hard or easy. Regardless of how you actually code it, the key here is to set the second Success Event (I call it Internal Search Results Clicks) only if visitors click on a search result item (not if they click on a second page of search results or go to another page through other navigation). It is also critically important that you only set this Search Results Clicks Success Event once per search term! Do not set it every time a visitor clicks on one of the search results after using the “Back” button. If you don’t do this correctly, your Click-Through and Exit Rates will be off. This could take a few iterations to get right, but stick with it! In this example, you can see that the search term “api” had one click only in either scenario, but the search term “chatter” had people click on it 100% of the time and 5 times they clicked on two search result items. 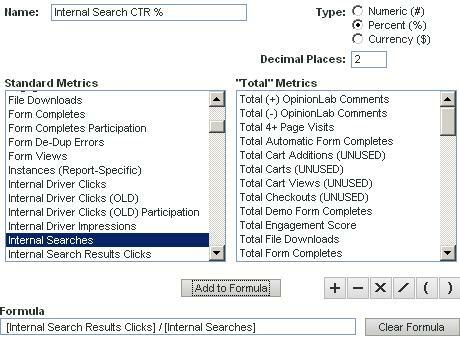 If you want, you can create another Calculated Metric that divides the Internal Search Result Clicks (All) by the # of Internal Searches to see how many search result clicks each term averages. In the case of “chatter” above, it would be 2.25 search result clicks per search! 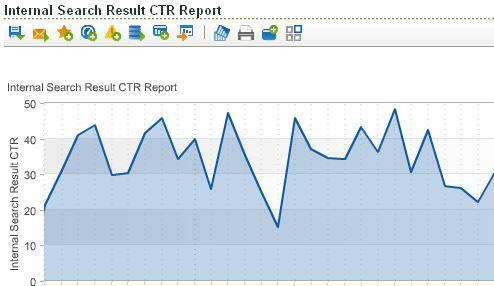 How would this click-through rate differ from simply using a pathing report? I would like to move toward your method but am wondering how different the results would be. I am sure there are more, but these are a few that come to my mind quickly…Thanks! is it possible to set this Search Results Clicks Success Event once per search term with a plugin of sitecatalyst? It is possible to do that using Event Serialization.